October 24, 2011 - Pratt & Whitney has received Transport Canada type certification for its PW210S engine, selected by Sikorsky for the S-76D medium-sized helicopter targeting corporate, offshore oil, medical, airline and government operators around the world. "This is a terrific milestone for this exciting and game-changing helicopter engine program," said John Saabas, President of P&WC. "The PW210S has been designed to offer the highest power-to-weight ratio and lowest fuel burn in the market, which translates into payload and range benefits for the helicopter. With this key certification, we are now looking forward to moving into the production phase of this program." 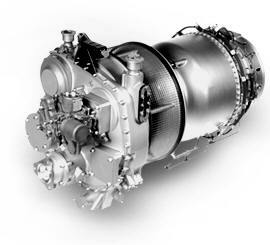 The PW210S incorporates the most recent advances in materials and compressor design, including dual-channel FADEC (full-authority digital engine controls) for ease of pilot operation and training, state-of-the-art diagnostics capability, including automatic fractional cycle counting, automated power assurance, unmatched operating economics and rugged design. Sikorsky is the launch customer for the PW210S, a new-generation engine for large single and intermediate-to-medium twin helicopters in the 1,000 shp class. Sikorsky's S-76D helicopter achieved first flight on February 7, 2009 and its test flight program is continuing, with helicopter certification scheduled for 2012. The PW210S is a member of the PW210 engine family and designed to deliver a wide-range of power while delivering P&WC's legendary performance in reliability and durability. "The PW210 demonstrates our firm commitment to developing innovative products designed and built to satisfy customers' ever growing needs and expectations," said Saabas. The Sikorsky S-76 is an American medium-size commercial utility helicopter. The S-76 is powered by two turboshaft engines, which drive both the main and tail rotors, each with four blades. The S-76 landing gear is retractable. Development of the follow-on S-76D model has been subject to delays due to technical problems in expanding the flight envelope. It will be powered by 1,050 hp (783 kW) Pratt & Whitney Canada PW210S engines driving composite rotors and will incorporate active vibration control. Three prototypes have been used in the certification program. One aircraft will be used to obtain certification of an optional electric rotor ice-protection system. Performance is anticipated to be substantially improved with the added power, but initial certification will retain the same 11,700 lb (5,307 kg) gross weight and maximum 155 kn (287 km/h) cruise speed. ?We have conducted a robust test program to ensure that this engine is ready to enter service, so this is a key milestone in the development of the S-76D helicopter,? said Tim Fox, S-76? helicopter Senior Program Manager. ?It demonstrates that the engine?s capabilities meet or exceed regulatory requirements. It propels Sikorsky another step closer to certification of this exciting new aircraft.? ?With every milestone achieved by the S-76D helicopter program, the legacy of the Sikorsky S-76? series grows,? said Ed Beyer, Vice President of Sikorsky Global Helicopters. ?The medium-size helicopter market is ready for the enhanced functionality, improved quiet ride, and power that the S-76D helicopter offers. Our customers are embracing the advances in technology and new efficiencies, and we are focused on delivering on all counts.? The new generation S-76D helicopter will perform an array of civil missions including executive transport, offshore oil, emergency medical services, and a multi-mission role. Among the S-76D helicopter?s features are all-composite, flaw-tolerant main rotor blades; an advanced THALES integrated avionics system and autopilot; quiet operation with active vibration control; powerful Pratt & Whitney Canada PW210S engines; and an optional Rotor Ice Protection System (RIPS) for all-weather capability. There are currently more than 47,000 P&WC engines in service on over 27,000 aircraft operated by some 10,000 operators in 200 countries. The most extensive support network in the industry, which includes more than 30 company-owned and designated service facilities, supports this global fleet.